With the inclusion of a bring your own device policy comes certain risks that must be mitigated before moving along with the process. With the demand of mobility constantly growing, organizations are scrambling to accommodate their employees and customers. However, with this implementation come significant security risks. 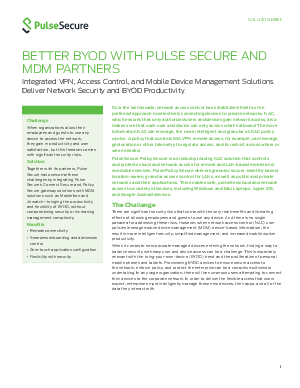 Download this whitepaper to learn how to achieve a better BYOD policy for your organization and see how to properly implement an integrated VPN, access control, and mobile device management solutions to deliver network security and BYOD productivity.